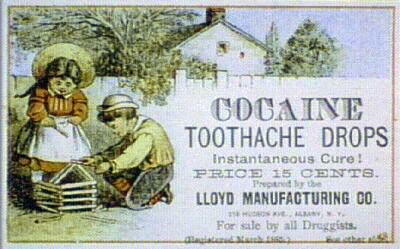 If you had a nagging toothache back in 1847 you likely let it nag for as long as you could stand it but as the pain worsened you would have scraped together 15 cents, a lot of money in 1847, and gone down to McAllister Drug Store on Main Street to buy up a bottle of cocaine tooth drops. These drops would have dulled the pain for a time but eventually the pain would have been intolerable and you would have sought professional help. In those days you would have gone to a doctor, perhaps Dr. Job Holmes on Main Street. If you can identify the tool above you probably haven’t been to a dentist for a very long time and should consider making an appointment. It is called a “tooth key” and the one pictured is a much improved model on the original which was invented in the 1700’s. In 1847 Dr. Holmes, after examining the tooth and pronouncing it beyond salvation, would have reached into a cabinet and produced a tooth key very like the one above. You would have trembled, for good reason and calculated the distance to the front door of the Holmes Cottage where Dr. Holmes practiced medicine in 1847. 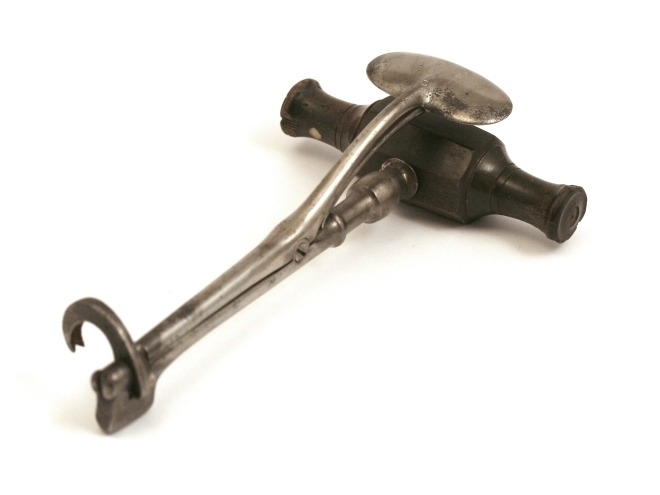 It doesn’t take a lot of imagination to understand how the “tooth key” worked- the claw at the bottom was attached to the offending tooth, the lever was held firmly to tighten the claw and grip the tooth and then, with feet braced, the key was simultaneously twisted and pulled violently. This was all done without anesthetic of course. What could go wrong? Well plenty it seems according to W. W. Brown who describes a not atypical extraction done in 1847 by Dr. Swan of Calais. Another “one-horse shay” which might be seen at almost any hour, night or day, in Calais or St. Stephen, was that of Dr. Job Holmes. Whenever you met the doctor he always had a smile and a pleasant word and seemed to be indefatigable in attending to his professional duties. 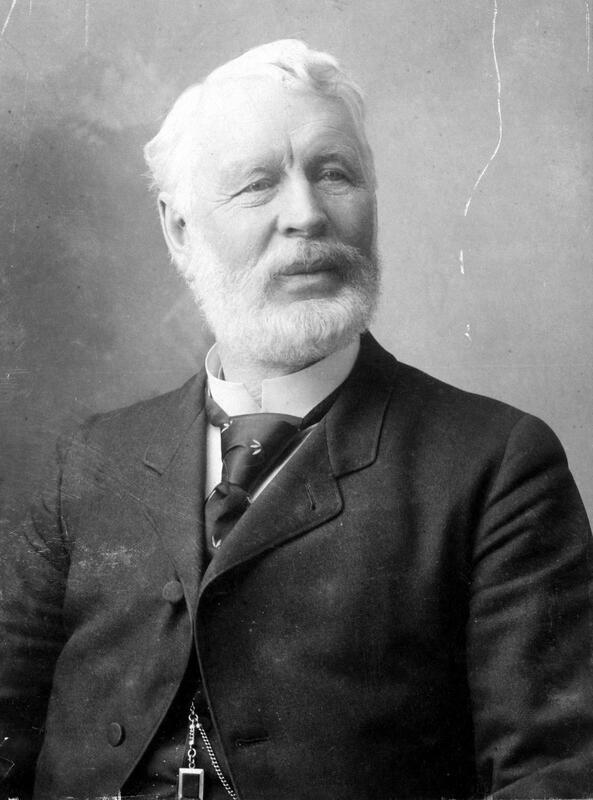 Dr. Charles Swan was first a student with Dr. Holmes, afterwards his partner and finally his successor, on the demise of the Doctor. I recollect hearing Dr. Swan telling one of his experiences while a student under Dr. Holmes. One day a man from up river came into the office suffering with the toothache and having his head bundled. The sufferer asked for the Doctor but as the Doctor was out and not likely to return soon, the young student said that he would draw the tooth. It was in the day before dentists were in vogue, and the sole instrument used to draw both molars and incisors was an indescribable concern, with a cross-handle of wood. Care had to be used in handling the machine as it had a tendency to leave the tooth to which it was applied and grab the next one. The young Esculapius placed the instrument on the right tooth; there was a yank and a yell and as the operator dropped the tooth into his hand he saw that he had drawn the wrong tooth- a perfectly sound one- and he said to the man, “Hold on! : I’ll fetch it this time.”: Another yank and yell resulted in the extraction of the decayed tooth. After recovering a little, the man thrust his tongue into the cavity in his jaw and said, “What a h–1 of a big hole”. He thereupon paid the usual price for tooth extraction and went away, unconscious that he had left two teeth with the embryo physician, who afterwards became the skillful and jovial Dr. Swan. Indeed Dr. Swan, the distinguished gentleman above, became not only a respected physician and we hope a much better dentist but also a community leader. He was so beloved the City renamed the street on which he lived, then Grosvenor Street, Swan Street in is honor. 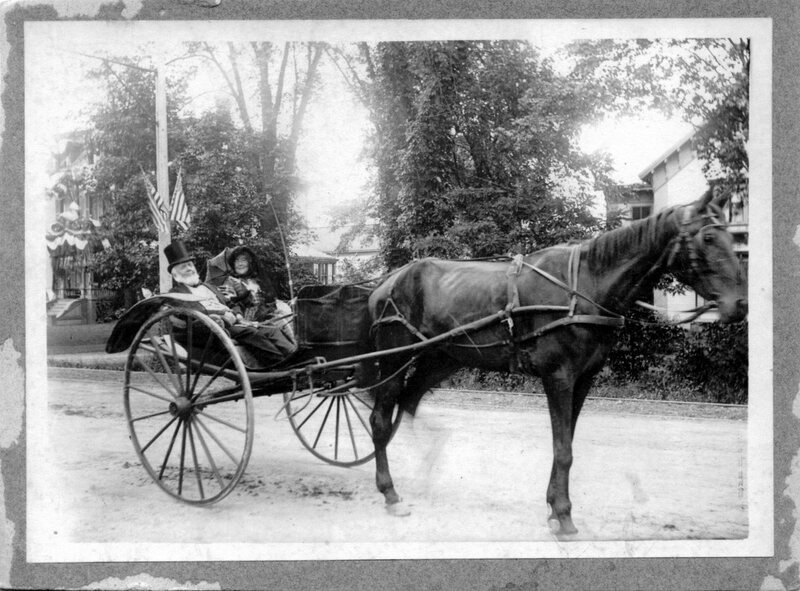 He is seen above with his wife who was known as Minnie in their buggy on Main Street. 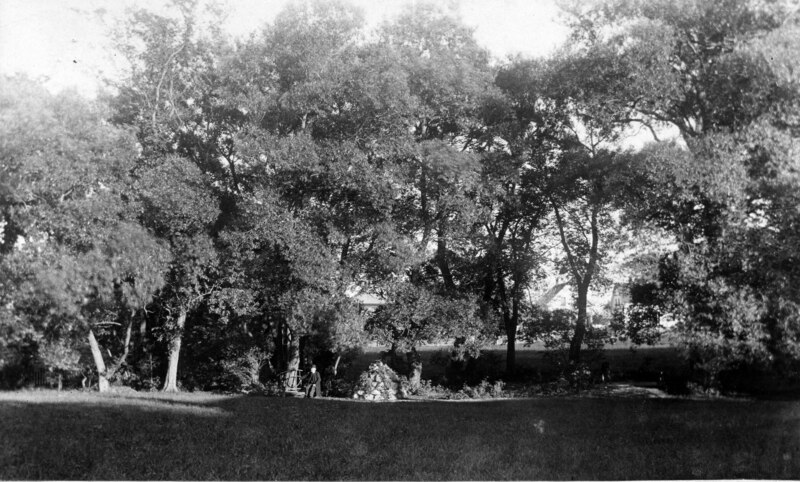 The photo was taken about 1900. 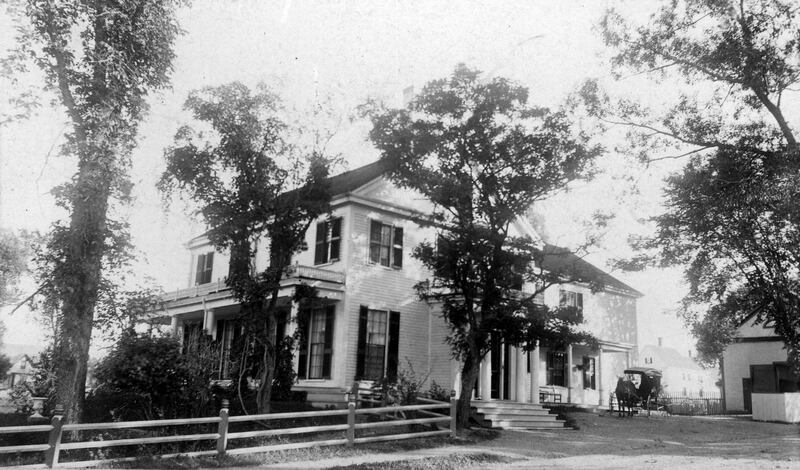 Dr. and Mrs. Swan lived in the house on Swan Street now owned by Richard Auletta. It is one of the nicest homes in Calais and the Swan property originally encompassed much of the block bordered by Main, Washington, Swan and Barker streets. The house and barn looks much the same today. The four large windows of the spacious living room and parlor face Main Street and river, the entrance to the house is on Swan Street. To the front of the house facing Main Street and the river was a lovely sculpted and terraced lawn which sloped toward Main Street. 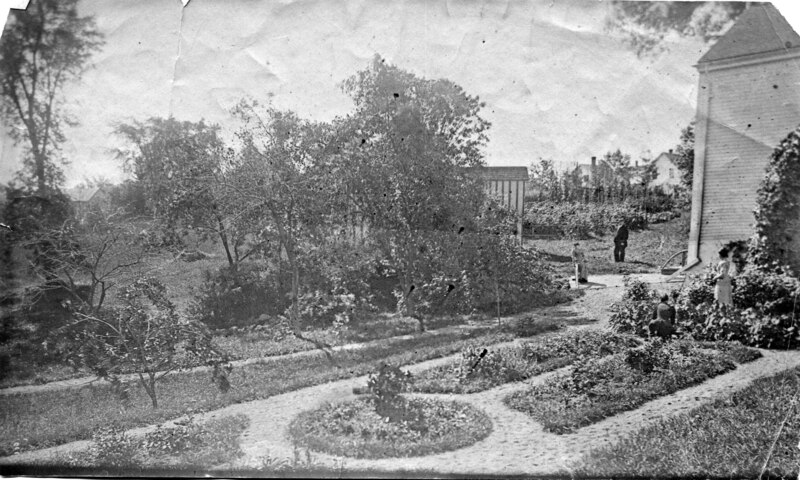 Toward Barker Street were flower gardens, arbors and fruit trees. 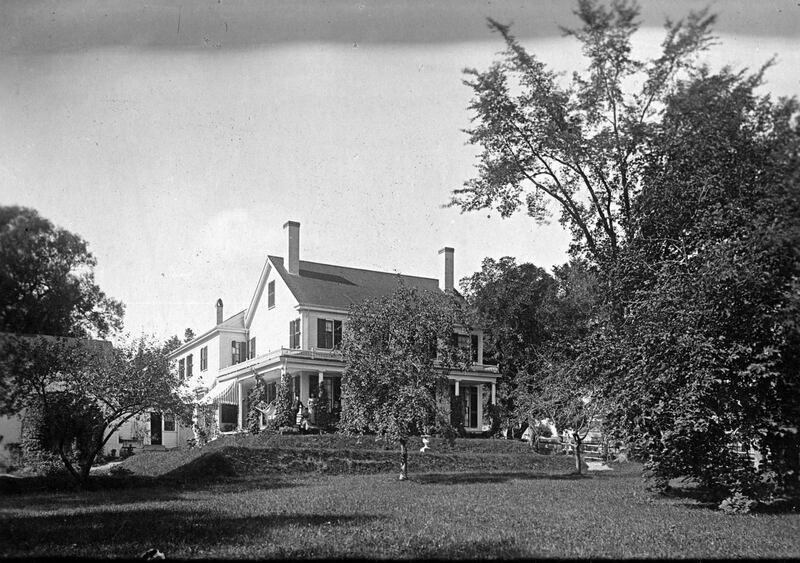 When the Swans lived in the house there were as yet no homes on west side of Barker Street, the property was owned by Dr. Swan and he maintained the area in back of the house below Washington Street as his private nature preserve. He can be seen sitting on a bench with Barker and Washington streets in the background. Two of four large windows of the living room can be seen in this interior view of the home. There are matching fireplaces at each end of this large room and both of the room and the fireplaces remain much as they were 150 years ago. 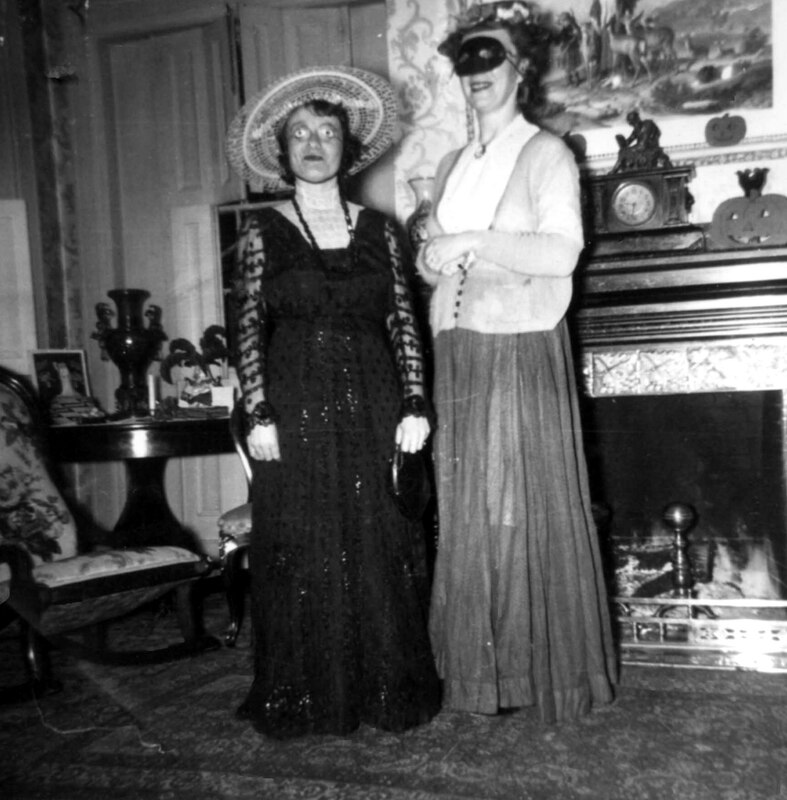 Betty Barnes and Harrriet Pomeroy are standing in front of one of fireplaces in this 1950 photo. 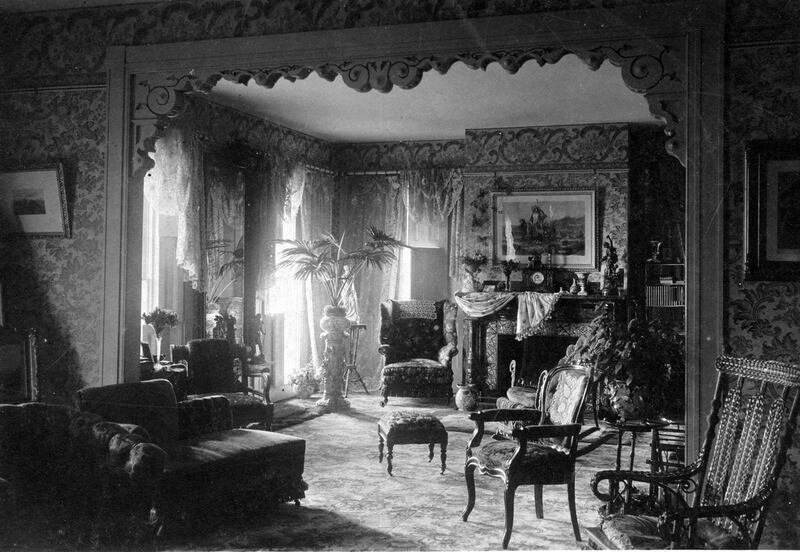 For over a century the large living room of the Swan house was the site of events and celebrations of all kinds. If walls could talk the walls of the Swan House could tell more interesting tales than any other in Calais. There are only a few of the beautiful old homes of yesteryear still standing in Calais and the Swan house rates a place near the top of this sadly short list.